We knew we were royally fucked one minute into the game, in round one of our first encounter. Two PCs had just gone down in combat, and it was clear we were both outnumbered and outclassed by our enemies. We had miscalculated the odds, and were on a suicide mission right from the first step. One of my characters had a Strength of 3, and another was a hobbit haberdasher with a pair of sharp scissors; our opponents had real weapons, including crossbows, and they were dug in in an ambush among the bushes. Then it happened. In the face of certain death, you might as well give it your best shot, and go all out. We rushed them out of sheer desperation and hacked at them until they went down and we won. Then we won and won again while expecting the worst, usually at terrible costs, but we got better and won some more. And we killed the minotaur. This combination of overwhelming odds and reckless heroism is the addictive idea Goodman Games had hit on with what would eventually become the DCC “funnel” concept, pitching a handful of zero-level nobodies into the meat grinder and seeing what comes out at the other end: ideally, a few battered heroes, and lots of bloody paste. The play style is one way to achieve an approximation of the low-level D&D experience under 3rd edition rules, and it has been canonised in the DCC RPG as an element of the character creation process. DCC’s power level is a kind of compromise between the 3e and old D&D approach – the characters are fragile, but there are mechanisms and extra abilities to compensate for that weakness, including a post-battle body recovery rule (essentially a saving throw against actually buying the farm). In this review, I am looking at one of the early examples of these “grinder” modules; it was originally made for 3.5, while we played it at a convention DCC game, with six players running three zero-level characters each. The review will also contrast how the module reads vs. how it was run by our GM. As mentioned above, Halls of the Minotaur pits a bunch of hapless villagers against a marauding minotaur and its underlings. The action begins in a monster-infested forest, before it moves into a dungeon dug into a steep cliff, then a citadel on top of the cliff. Most of the keyed encounters begin as combat encounters – you move into a new area, fight a group of monsters (and if you are careless, deadly reinforcements), then you can check out the local details. Setpiece combats in cool locations – at a forest ambush site, before a demonic idol flanked by braziers, on a rope bridge, etc. – serve as the key attraction. The module has an element of infiltration/stealth that can make the combat situations (the preparedness and grouping of enemies) easier or harder, and the PCs will need all the advantages they can wrest from their environment. There is also an element of non-linearity that is almost real and feels real for about half of the adventure, but turns out to be largely illusory (there are a few branches and alternate routes early on, but the true way through most of the place is one way only, and the rest are blocked off by increasingly contrived ways). As a typical feature of the early DCC modules, the room descriptions often give you the kind of wacky, imaginative room ideas you’d get in the Fighting Fantasy gamebooks – say, a dragon’s head rising out of an underground river, or a throne room concealing a deadly ambush, or fighting your way through the dungeon to emerge in a castle on top of the cliff – but they are somehow never actually as wild and out there when you interact with them. Likewise, the environment has layers of history and some really decent visuals, but again, it doesn’t amount to much, since it is a series of kobold battles in a fancier than average dungeon environment. Or is it? This was an adventure that had gained a lot in the telling. Around the table – and remember, this was a casual convention pickup game – it felt real. Fairly standard areas took on a character they didn’t have in the text I read later. The desperation of the action – whose unfairness had turned us into crafty, vicious little opportunists – imbued the game with authenticity and a sense of working against time. Little touches to make the environment more mysterious – like turning some fairly standard kobolds into strange beastmen, or refining standard encounters into indecipherable enigmas – gave it a touch of fantasy that had gone beyond the standard D&D playbook. That is to say, a good GM can do much with the material even with a fairly light touch; but also, this is a module with more untapped potential than it seems to have on first sight. It really did play better than it reads – had I come across it when I was still trying to find gems in DCC’s 3.5 module library in vain, I might not have seen the gem in the rough. Which is not to say Halls of the Minotaur is a great module. It is a decentish one with typical design issues of its time and publisher. It always feels like the encounters are overwritten – much boxed text and followup writing are expended to say relatively little (developments in the old-school scene since 2006 have been massive in this respect). The 3.5 stat blocks are cumbersome, using mechanically complex methods to express interesting, but relatively simple ideas. I have already mentioned the other stuff. It is 12-16 decent pages lurking in a 32-page package (although with a Doug Kovacs cover and great illustrations by Stefan Poag). However, if you don’t mind giving it a thorough read and some thought to adapt it for yourself, the good stuff is more than enough to carry a fun, action-packed adventure. The module credits its playtesters. Hey, I think I've played this! I was a 0-level halfling street kid. I think we killed the minotaur by luring it into some kind of fire trap? It was alright, but I mostly remember it as pretty generic: woods, kobolds, dungeon, minotaur, the end. It sounds as though you had a better GM than we did! Sounds about right. It is a fairly generic module that worked like a charm with a bit of varnish. 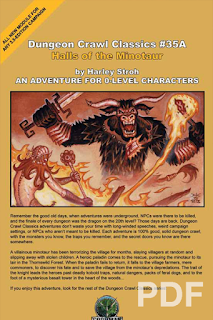 The Forgotten Halls of the Last Minotaur is a better adventure. Perhaps, but not even Google knows about that one. So you had 18 characters? That looks pretty unwieldy. Judging on the review, there's nothing special at all about this adventure, just old-fashioned monster bashing which can be tiresome in itself. The "player (or GM) element" can make or break a gaming session indeed, but that has little to do with the quality of the module at hand. They were index card-sized character sheets. I don't know where to put this so I'll put it here. Why don't you conduct a poll where you ask people which of your adventures they would like to see augmented with art and so on. For me it would make no difference but you have a low visibility but very good map of fomalhaut, and you could explain which of your adventures subsist on that map. D&D people need maps, and then you place your adventures on the maps. That's the way they think. If I was you, I would would present the map and brief discursus, one, an adventure, two, a link to premier's write-up, three. I would avoid presenting 'the wacky worlds of Melan' and integrate your ideas because frankly anything you can conceive would fit in a small regional place. A map is forthcoming, although it is going to be the Isle of Erillion first, not Fomalhaut, since it is only one map sheet vs. nine. (Fomalhaut is something on my mind, but it would be more of a Wilderlands-style create-your-own kit than a full world guide).